Charlotte’s BAG chair Cressy Brooks and daughter Tallulah represented Charlotte, Alex and Miles at this fantastic event at the London Palladium on Tuesday November 22. Celebrating the creativity of youtubers and vloggers in the UK and internationally, Charlotte’s video with Marcus Butler for Stand Up to Cancer was nominated in the Campaign Video of the Year category. 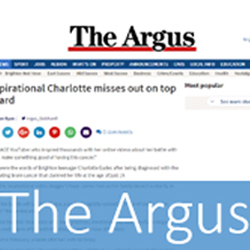 Although we didn’t bring home the award we were delighted that Charlotte was nominated in a category with some very tough competition, and it gave us a chance to put her story and Charlotte’s BAG in front of some very influential opinion-formers.